Welcome to the fourth edition of our new bi-weekly feature Upfront Mini Bytes. In Upfront Mini Bytes we will provide eight tasty bits of genealogy news that will help give you a deeper byte into your family history research. Each item is short and sweet. We encourage you to check out the links to articles, blog posts, resources, and anything genealogical! We hope you found the first edition, second edition and third edition helpful. Genealogy research and frustration often go hand-in-hand. Read this great post Avoiding Genealogical Search Frustration for some neat tips on how you can do better research and hopefully be less frustrated in the process. Though we are not necessarily academicians, using exhaustive research methodology and extensive documentation of sources for family history research does make academics happy. Since we share a desire for excellent source material and information with academicians and we are always on the quest for “search engines” to facilitate our online hunting of data, finding aids, published books and more, check out 12 Fabulous Academic Search Engines. We can always use some good news! We also know how invaluable family Bibles are. Ohio man recovers stolen 300-year-old Bible handed down in his family through generations tells of a Bible where the dates for seven generations of family are recorded was stolen and then returned. The preservation of structures and places of historic and genealogical importance continues to be a hot news topic. Check out Preserving African-American Historic Places: New Resource Available. This relates to the recent Upfront with NGS post Historic preservation and access -- just as important to genealogists as document preservation and access. And it’s never too late to prepare for Preservation Week 2013. Though this event focuses more on preserving collections, it is a reminder that we need to be preserving our heritage for generations to come. Want to learn more about crowdfunding a genealogy or family history project? See what the Genetic Genealogist has to say in Thought For the Day – Crowdfunding Genealogy and see the recent Upfront with NGS post Kickstarter -- Need a genealogy project funded? This might be the way to go! It’s always great to read a story about a building renovation especially when “old” documents are discovered. DA gives old court records to historical society. Have some Irish ancestry? Or, maybe just a yearning to visit Ireland? Ancestry.com and Great Value Vacations have launched the Ireland Coast to Castle Sweepstakes. The winner receives a 1-week trip to Ireland as well as a 1-Year Global Explorer Ancestry.com Membership, AncestryDNA kit, Copy of Family Tree Maker (FTM) 2012 (PC or Mac) and up to 10 hours of ProGenealogists research support. Speaking of contests, check out this Pinterest page, Genealogy Contests and Giveaways. 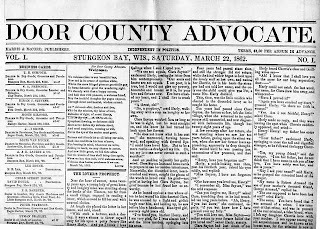 Door County (WI) Library Newspaper Archive now live! 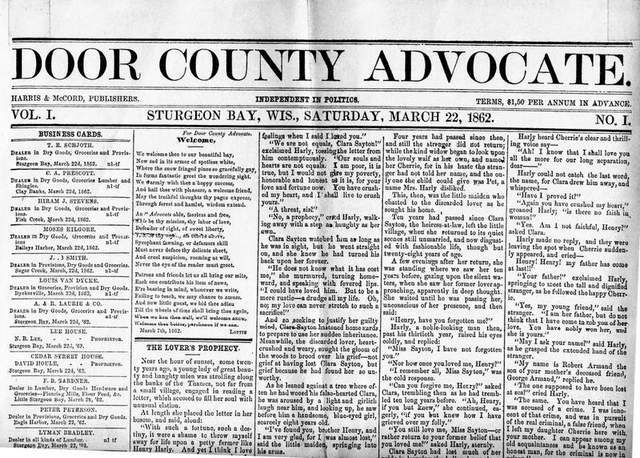 This neat archive covers several newspapers and spans the period 1862 to1925. Learn more about the collection via Historic newspapers now available online.